A massive win for the Giants who have posted their highest ever score (160), and biggest ever win (102). GWS dominated in all areas of the game starting with clearances (4330), and punished the Gold Coast errors (104 points from turnovers). The behind to Haynes gives the Giants their highest ever score, and they look set to also post their biggest ever win. The 104 points they have scored from turnovers is also their most ever. The Giants are closing in on their highest ever score (158 points against the Hawks in round 6 last season). Jarrod Witts leads all Gold Coast players for contested possessions (11) and clearances (five). GWS has now returned an incredibly accurate 14.2. (86) from set shots at goal. Gold Coast has scored 4.4. (28) from its set shots at goal. As well as punishing the Gold Coast turnovers, GWS lead in scores from stoppages 6.6. (42) to 1.2.(8). The Giants were ranked first in scores from stoppages differential last season. The goal to Devon Smith puts the lead back out to 83 points. 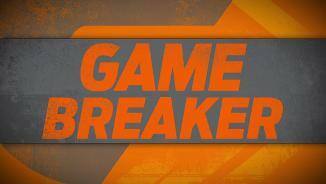 The biggest ever win by GWS is 92 points against Fremantle in round 22 last season. Josh Kelly now has a gamehigh, and equal career-high 13 score involvements (including three goals). 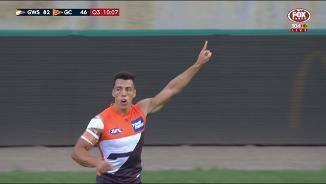 Nine goals in a row to the Giants, and five goals for Jeremy Cameron who has also worked up the ground to take a gamehigh 10 marks (he has only once taken more marks in a game). GWS with a 131 advantage in effective disposals leading to the opening two goals to start the final quarter. Dylan Shiel and Callan Ward have a combined 28 contested possessions (no Gold Coast player has more than eight), and 18 clearances in a strong midfield display. 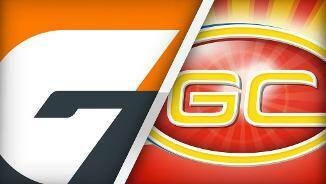 GWS has cleared out to a gamehigh 58 point lead on the back of six unanswered goals to end the quarter. The Giants have punished the turnovers by the Suns and scored 13.4. (82) from this source. GWS has a 4430 advantage in inside 50s, but in a sign of better ball movement lead forward 50 marks 14-6, and 38-16 for effective disposals in the forward 50. The Giants continuing to punish the Gold Coast turnovers, have now scored 9.2. (56) from 15 forward half intercepts. The AFL average is 29 points from 23 such intercepts. 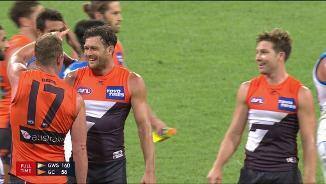 GWS has now scored the last four goals of the game, after the Suns had kicked the previous five. The Giants have scored 2.2. (14) from 14 centre bounce clearances. The Suns have not scored from their ten centre bounce clearances. After Gold Coast started the quarter positively, the Giants have now had the last eight inside 50s and lead the clearances 83 this quarter. 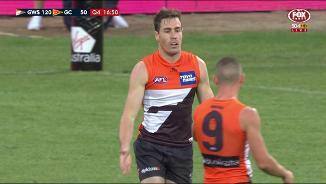 A terrific tackle from Ryan Griffen sets up a goal for Jeremy Cameron. The Giants have now scored 7.1. (43) from 13 forward half intercepts. Gold Coast has scored 2.2. (14) from eight such intercepts. A bad turnover in the defensive 50 by the Suns hands a goal to GWS. The Giants have now scored 3.1. (19) from four forward 50 intercepts. Last season they averaged 9.6 points per game from this source. Good forward pressure from Jack Martin in the forward 50 sets up a goal for Gary Ablett. The Suns lead in forward 50 tackles 85. Gold Coast now has four goals in a row and Jack Martin three. The Suns have now scored three goals from intercepts in the defensive half, but just the one goal from nine forward half intercepts. All of the ten Giants goals have come following a mark of free kick, and they have missed all five shots at goal on the run in the first half. The Suns led in effective disposals (8258) and tackles (12-9) during the second quarter, and were able to restrict the Giants ball movement and dominance from the opening quarter. 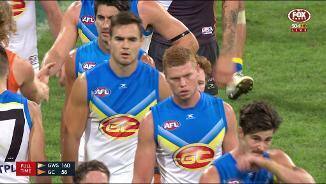 Gold Coast was able to fightback late in the second quarter, and eventually outscored GWS by four points that quarter. The Suns improved their ball control and led in marks 3111. Gold Coast has now scored three of the last four goals in the game. The Kolodjashnij goal was the Suns first score of the game from a stoppage (they scored 45 points last week from this source). First year player Ben Ainsworth is doing well for the Suns, and currently has eight disposals (at 100 percent efficiency), and four contested possessions (the second most of any Gold Coast player). Dylan Shiel currently has gamehighs for contested possessions (eight), disposals (15) and clearances (five). He also has been involved in seven scores in a strong offensive first half. Gold Coast has missed six tackles already (compared to GWS one). The AFL average is four per game. The Suns end a streak of six goals to GWS with the Witts goal coming following a Jarryd Lyons score assist (his second). 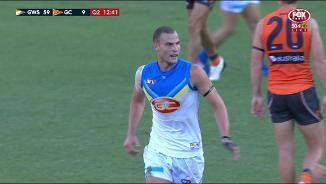 Lyons recorded an equal competitionhigh five score assists against the Lions last week in his first game for the Suns. A clever goal from Kelly has the Giants with 8.1. (49) from set shots at goal and kicking efficiency of 79 percent (the AFL average is 66 percent kicking efficiency). The Suns could score a goal with only 19 percent of their inside 50s last week, which was the equalsecond lowest percentage of any side for the round. They have one goal from 13 entries so far today. Gold Coast has seven players yet to have an effective kick, including key midfielders Ablett, Hall and Barlow. GWS has just the two such players. Despite having had more control of the ball, the Giants lead in tackles 2012. GWS was far more effective with the ball in the opening quarter (kicking efficiency 78 percent compared to Gold Coast 65 percent), which lead to 1710 inside 50 advantage and 7-2 for marks inside 50. Whilst the Suns have had more disposals, the Giants lead in effective kicks 4322 as they have picked their way through the Suns defence. The Giants have won their last four games against the Suns by an average of 45 points, and have made a powerful and efficient start today, scoring 6.1. (37) from seven set shots at goal. GWS has scored 5.1. (31) from 13 intercept possessions, compared to Gold Coast who has scored 1.2. (8) from 12 intercepts. After scoring their first three goals from turnovers, the Giants fourth comes from a stoppage. In 2016, the Giants scored 42 points per game from stoppages (ranked first). Last week they scored just 20 points from this source (ranked second last). Adam Saad launching the Suns first goal off half back, had 12 running bounces last week, which was three more than any other player for the round, and better than 13 team’s totals across the round. Both teams have had six chains starting in their defensive 50, but indicative of the difference in ball movement, the Giants have generated three inside 50s and three scores (all behinds) from these chains, while the Suns have not generated an inside 50. GWS has generated six score from just seven inside 50 entries, compared to the Suns who have one score from six entries. The Giants scored from 49 percent of inside 50s in 2016 (ranked third). Gold Coast gets its first score of the game following a forward half intercept. The Suns generated 29 forward half intercepts last week (ranked second), but scored from just 24 percent of these intercepts (ranked last, AFL average was 40 percent). Jacob Hopper setting up Toby Greene for a set shot at goal. 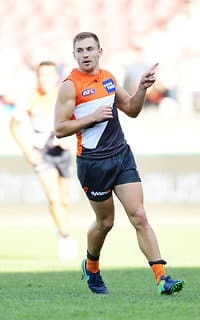 Hopper who returns today for the Giants, collected 32 disposals, five marks, nine clearances and seven inside 50s in his AFL debut against the Suns last season. A very hot start from the Giants who have already generated three scores, while the Suns have only had two effective disposals. The Giants score the opening goal of the game following a forward half intercept, they scored 34 points per game from this source in 2016 (ranked third). GWS with the first score of the game from the opening centre bounce. The Giants scored 14 points per game from centre bounce clearances last season (ranked fourth), and had a differential in scores from these clearances of 3.7 points (ranked first). The 147 points conceded by GWS last week is the highest score against it since round 10 in 2014. The Giants only conceded more than 100 points on two occasions last season. The Suns scored 31 more points than their opposition from clearances in round one (ranked first), but conceded 39 more points from turnovers (ranked last). Last week the Giants conceded 85 points from chains the Crows started in their own defensive half. In 2016, the Giants conceded an average of 32 points from such chains (ranked fifth), with a season worst of 57 points against Collingwood in round 16. Gold Coast finished with 32 more inside 50s and 10 more marks inside 50 against Brisbane last week (both ranked first). Since 1999 only three teams previously had lost when winning the inside 50 count by 32 or more (from 100 such games). Welcome to Spotless Stadium for the GWS Giants v Gold Coast Suns Round 2 clash. GREATER Western Sydney has responded to its lackluster season opener by destroying a lifeless Gold Coast by a record-breaking 102 points at Spotless Stadium on Saturday. Stung by their 56-point loss to Adelaide last week, the Giants brought much more intensity to their first home game of the year, beating the Suns 24.16 (160) to 8.10 (58), in what was their highest ever score and greatest winning margin in the competition. GWS had winners all over the ground, as you'd expect in a lopsided contest, with Jeremy Cameron booting six goals and 100-gamer Toby Greene kicking five of his own. Midfielders Josh Kelly (27 possessions and three goals), Callan Ward (32 touches and 12 clearances) and Dylan Shiel (28 disposals and 10 clearances) were prolific ball winners, while co-captain Phil Davis was also outstanding in keeping his opposite number Tom Lynch goalless. 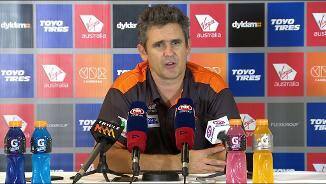 Giants coach Leon Cameron was understandably pleased with the way his side turned up the pressure on the Suns, especially the effort of Davis. "It's really pleasing, he's obviously our captain, but (Tom) Lynch is a terrific player," he said. "He's had a really good pre-season Phil, he wants to be a really good centre half-back/full-back, and he's started off the year really, really well. "I think he's building his game by not just defending really well, he wants the ball in his hands a little bit more as well, so it was a pleasing game from him." 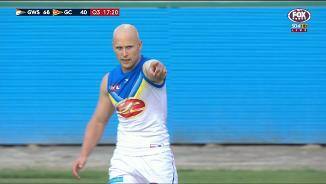 The visitors' effort and pressure on the opposition was substandard from the outset with former skipper Gary Ablett one of their worst offenders. The dual Brownlow medallist was unsighted in the first half, so much so that his first kick came 20 minutes into the second term, with the champ eventually gathering just 16 touches for the match. Rodney Eade's men had a brief period where they lifted and kicked five goals in a row either side of half-time, three of them to gifted young forward Jack Martin, but they went back to bad habits soon after and coughed up the next 10 as the Giants ran away with the match. Apart from Martin, onballers David Swallow and Touk Miller along with ruckman Jarrod Witts, tried hard for Gold Coast, while Rory Thompson and Kade Kolodjashnij were resolute defenders and stood up against the wave of Giants' pressure. 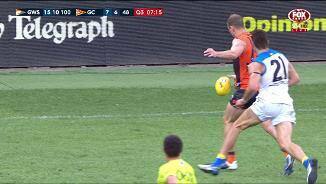 The Giants lost big forward Jonathon Patton (hip) before the game but it mattered little; they kicked two goals in the first three minutes of the match, and seven in the first quarter, and were never tested after that in a way that would have satisfied coach Leon Cameron. 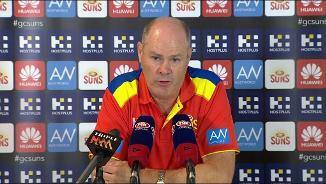 Eade remained surprisingly positive after the loss, and signaled a tough week at training for his players. "We need to talk about what we can do and how we're going to go about it. We need to get back on the track and work hard," he said. "We've got eight days now. That's the best way I know - hard work. There's no magic formula. You can't go down the street and buy some confidence from the shop." 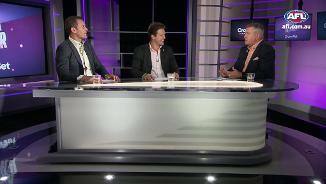 Greater Western Sydney: Running defender Nathan Wilson left the ground in the third quarter after landing awkwardly on his left shoulder, but returned to the ground and should be right to play next week. Key forward Jonathon Patton (hip) was a late withdrawal, but should be in the mix to return next week. Gold Coast: The Suns reported a clean bill of health. The Giants head to Tasmania for a clash with North Melbourne on Saturday afternoon, while the struggling Suns take on hawthorn at Metricon Stadium in the round's final match on Sunday.